It was for the first time that the green and white national flag of Pakistan with crescent and star flew at the Farnborough International Air Show 2010, England. The unfurling of the Pakistan’s flag marked Pakistan’s entry into the world’s most prestigious air show with two of its JF-17 Thunders. Although parked in one corner of the runway to make way for big giants and attractions like the Boeing 787, Airbus A380 and many other military and civil aircraft from leading aircraft manufactures, the pair of JF-17 Thunders still attracted a large number of visitors who came to see the “Mysterious aircraft from Asia (as some visitors remarked).” However as per reports available and for unknown reasons the aircraft did not fly during the show to show its full potential. These light weight multirole, all-weather combat aircraft have been jointly designed and produced by the People’s Republic of China and Pakistan. The pair that appeared on the air show has been assembled in Pakistan at Pakistan aeronautical Complex (PAC) Kamra. 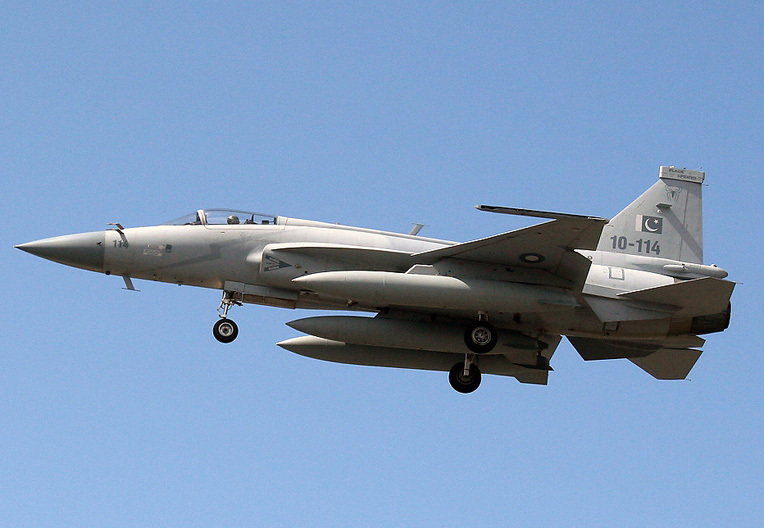 The JF-17 Thunder distinguishes PAF as the only air force in the world that manufactures combat aircraft. About 50% of the on-board equipment and avionics for the fighter have been manufactured in Pakistan, while the rest of the assembly parts coming from China. According to unconfirmed reports, Turkey and some countries from Middle East and Africa have shown their interest in these fighters.